PSU Library Special Collections & University Archives is pleased to announce a new collection of historic photographs created in collaboration with PSU Capital Projects and Construction. Explore the Portland State “College District” as it appeared from 1962-1966, in the early days of urban renewal and campus expansion, in a series of images in the University Archives Digital Gallery. 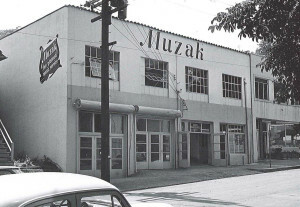 Muzak, 1962, a storefront at the site of the current Peter Stott Center. Compiled by Capital Projects and Construction Archivist Bryce Henry as part of the Architecture, Engineering, and Construction Archives, the College District collection includes more than 300 images of single-family and duplex houses, businesses, and other commercial buildings in locations now part of the Portland State campus. Many of the buildings photographed were torn down for large campus construction projects. The collection also includes images of buildings still in use on campus, including Lincoln, Cramer, and Neuberger Halls in various stages of completion. The notes in the images identify the year the photograph was taken, the location of each building, and, in many cases, information about what buildings are in those locations today. 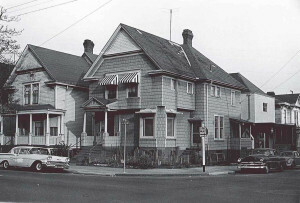 Photographed in May 1964, this duplex was demolished one month later. The site is the current location of Parking Structure 1. The University Archives collects, preserves, and provides access to the historical records of Portland State from its beginnings as Vanport Extension Center to the present day. The archives includes documents, correspondence, publications, program materials, photographs, moving images, and ephemera from administrative departments, academic units, student organizations, and faculty and staff. The University Archives Digital Gallery documents Portland State’s history through more than 11,000 images. Explore the College District collection in the University Archives Digital Gallery.